Alfred Pleasonton was a career Army officer who graduated West Point, July 1st 1844 and was brevetted a 2nd Lieutenant in the 1st US Dragoons. He served in the Mexican War and western frontiers with the 2nd US Dragoons before leading his regiment from Utah to Washington in 1861 to support the war effort. While stationed there, he kept his regiment in a constant and efficient state of readiness. 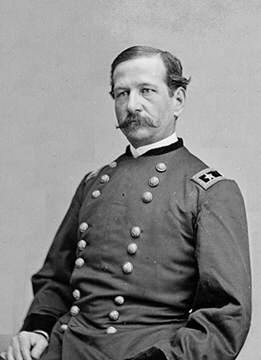 Pleasonton continued to command his regiment, redesignated the 2nd US Cavalry, until receiving a promotion to Brigadier General in 1862 and selection to command a cavalry division in the Army of the Potomac. 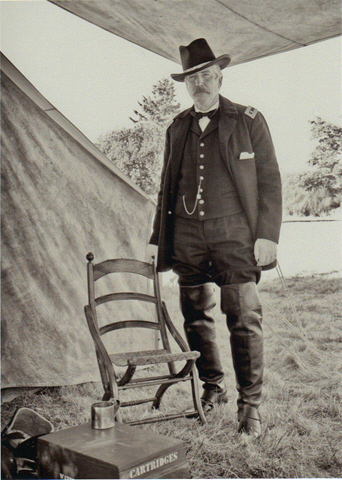 He eventually assumed command of the entire Cavalry Corps and was promoted to Major General in June, 1863. Pleasonton was engaged in numerous battles and cavalry campaigns in the east until his reassignment to the western theatre in March, 1864 where he served out the remainder of the war with distinction. He resigned from active service in 1868 and was officially retired in 1888. William R. (Bill) Fuzia of Seaside, Oregon, has been a civil war cavalry enthusiast for much of his life. He organized and commanded the 1st US Cavalry (Oregon) in 1989 which was then an active unit of the Sons of Veterans Reserve. Bill was also founding member of the Northwest Civil War Council and a member of the Sons of Union Veterans of the Civil War and Military Order of the Loyal Legion of the United States. 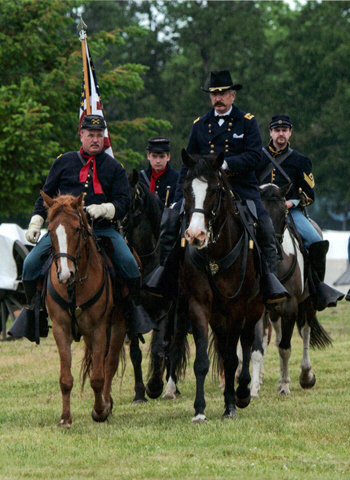 Bill is both a retired Air Force Captain and Deputy Sheriff who devotes much of his time to Civil War cavalry pursuits; an avocation that is near and dear to his heart. He has the distinct honor of being an active combatant with Co. A, 2nd U.S. Cavalry (Dragoons); one of the most respected cavalry units in the entire country. Bill is also engaged in a thorough research of his persona with an eye toward writing a proper historical biography at a later date. He and his family are currently planning their move back to the family home in Bluefield, West Virginia.